Yes. Sometimes the Dairy Man likes to be dramatic. But after we had a good chuckle, the basic point was still there. He was kidding, but not really. Spring is here and the busy season is off and running. I wasn’t really aware that we were ever in a “slow” season, but normalcy for farming starts a lot higher than the rest of the world. 60+ hour work weeks are the norm. Busy season means getting up really early, staying out really late, and working like a madman to get as much done as possible before the rain comes. My Dairy Man, his father, and/or my future brother-in-law have been known to still be in a tractor at 11 p.m. at night. This is my first planting season and I’m still adjusting. I find myself secretly hoping for rain so that I can see my Dairy Man for a few precious minutes. But it cannot rain. We will lose time, or the corn will get into the ground too late and the whole season will be thrown off. In this small farming community, it seems like every farmer and his brother is driving some type of machinery down a road or through a field. The town is buzzing with activity. 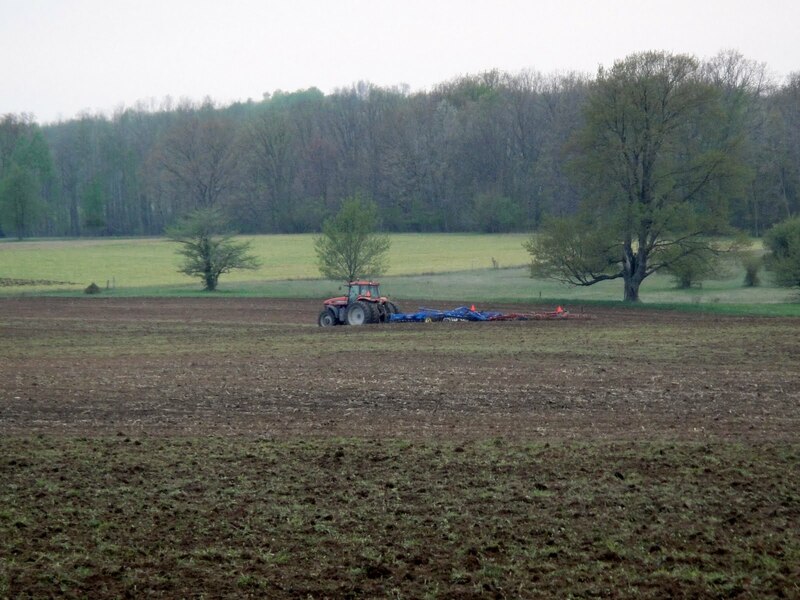 On my drive to and from work, a glance to either side of the road reveals fields speckled with shiny metallic tractors and the air is thick with the scent of … fertilizer. My Dairy Man and his father farm over 600 acres between our two facilities. Every square inch is planted with corn to be ultimately turned into feed for our cows. I don’t claim to be an expert on the intricacies of planting (just when I was finally getting the whole cow thing down, we started an entirely new aspect of farming! 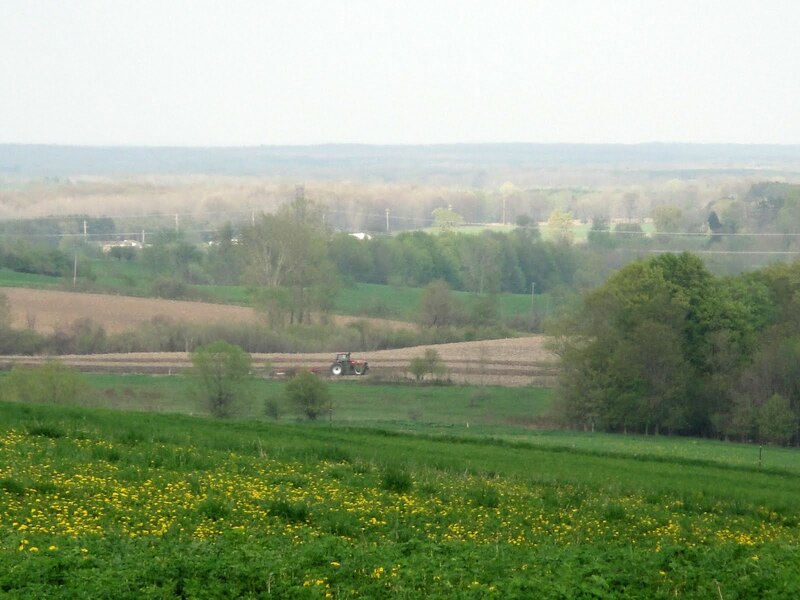 ), but I’m trying to learn just what my Dairy Man is doing out in those fields all day. One night I decided to find out. 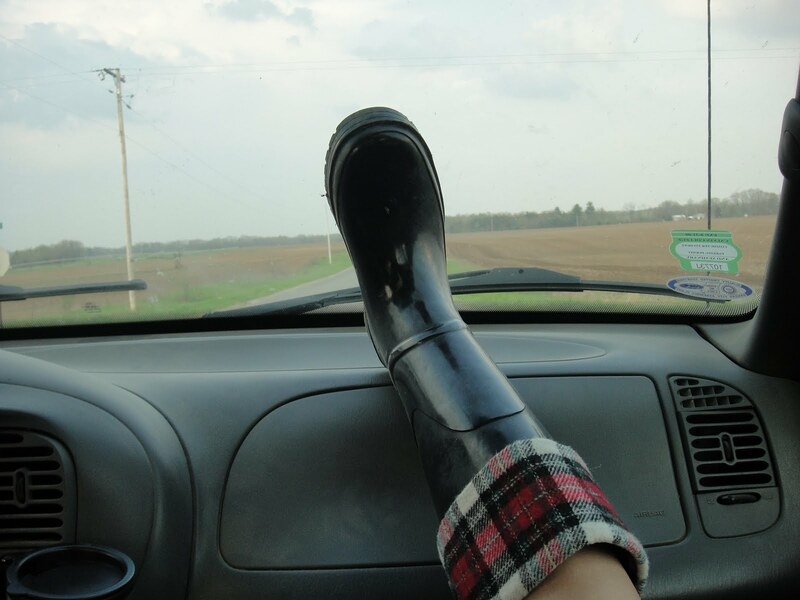 After work, I changed my clothes, pulled on my rubber boots, and set off to find the Dairy Man. I located him in one of the barns and sweetly coerced my way into a ride-along. We climbed into the big red truck and set off to check on the fields. This particular night it was his father and future brother-in-law sitting in the tractors. Here is my FIL working the ground. Conversations with the Dairy Man (and extensive research on Wikipedia) tell me that there are four main stages to planting a field: 1) fertilize, 2) chisel plow, 3) disk, and 4) plant. Fertilizing is an easy one to understand. We have many cows. Those many cows produce manure. 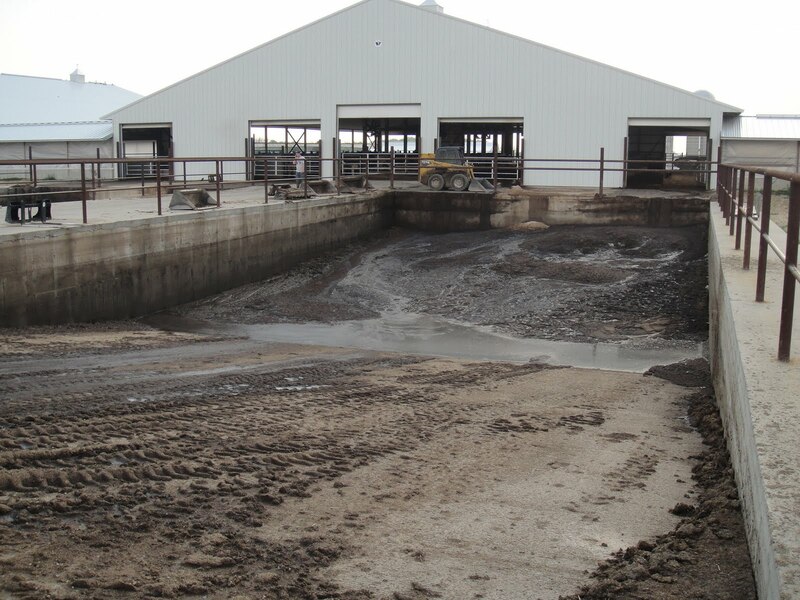 That manure is stored in pits (like the nearly-empty one below) during the winter and spread on the fields in the spring as fertilizer. How very green of us, eh? Though anyone who lives near a farm will tell you–it stinks to high heaven. This particular night, I was able to witness the disking portion of the planting process. Now, at long last, I know what this spidery thing actually DOES. Step #2, chiseling plowing, involves another piece of machinery to turn the soil. 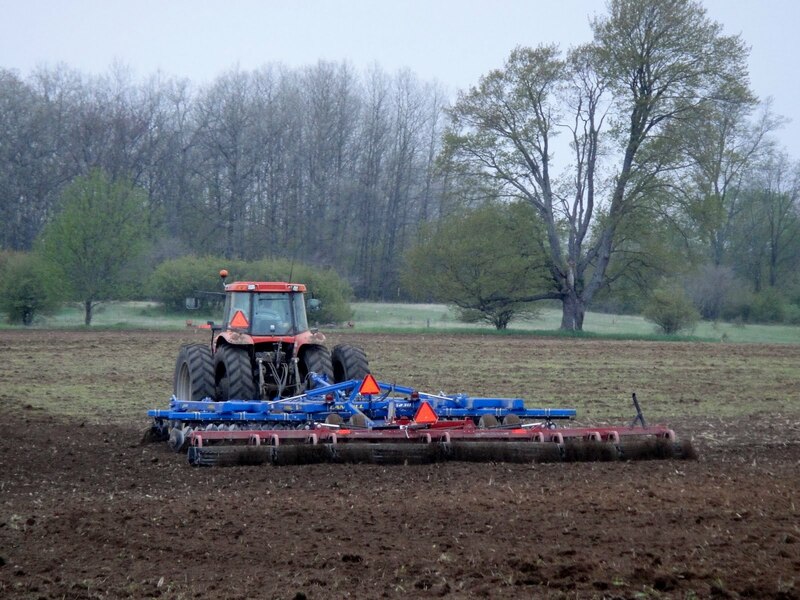 Using a disk harrow (below) finishes the top of the soil for planting. Not exactly a plow pulled by oxen, is it? Modern farming is big, intense, and involves a lot of giant toys. The Dairy Man still spends hours working the land, but his tractor has air conditioning and satellite radio. 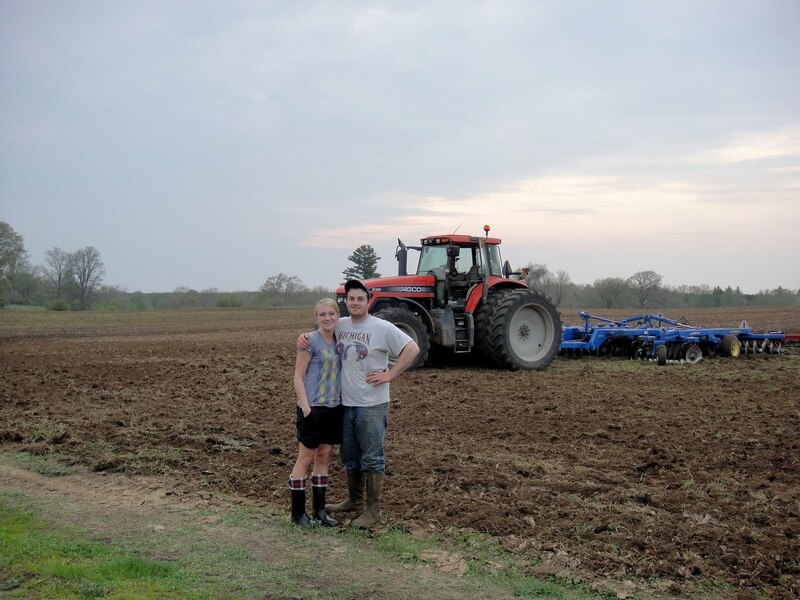 Once the land has been properly fertilized, chiseled, and disked, it’s planting time. 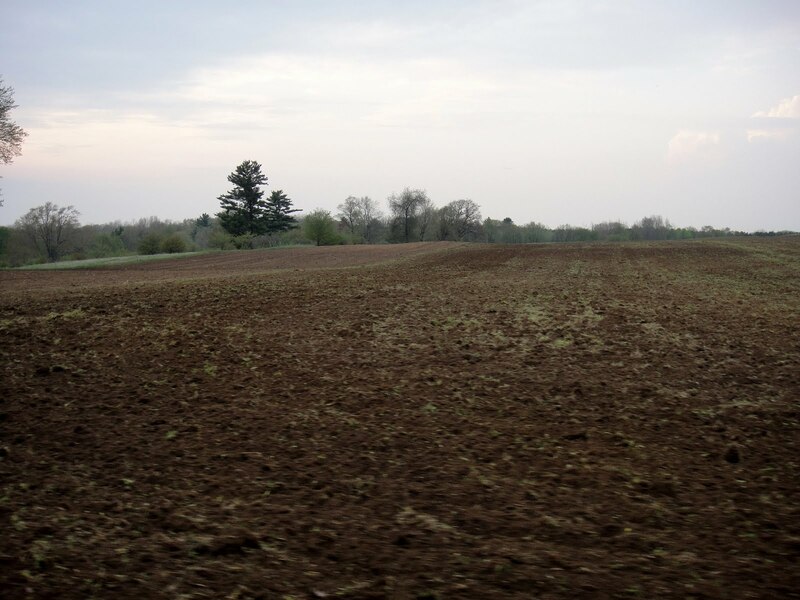 Within a few short months, this entire field will be bursting with leafy waves of corn. So, there you have it. Apparently planting corn does not involve throwing handfuls of seeds into an open patch of dirt. Who knew? Though that does explain why I haven’t seen the Dairy Man for more than twenty minutes per day in the past week. 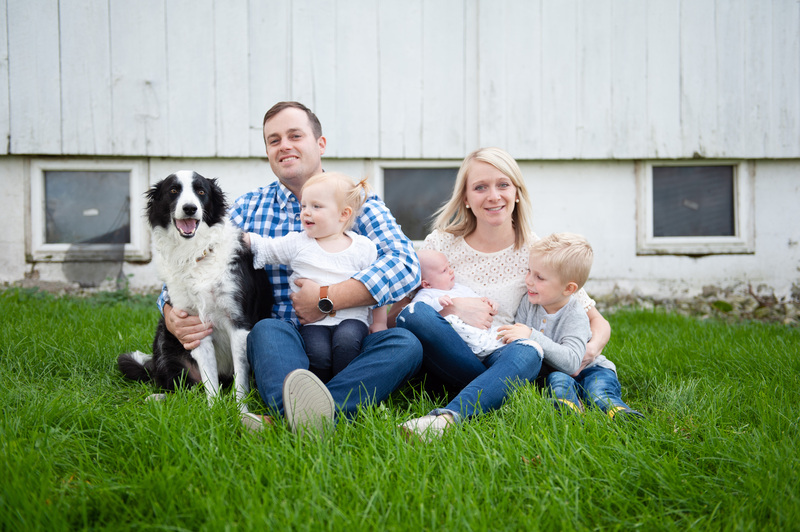 It hasn’t been easy being a planting widow, but I know that this craziness won’t last forever. And a long hug in the morning can get me through just about any kind of craziness. Previous Post That’s just not natural.